Whilst I’ve been busy with actual job work (boo) and KDE Telepathy, Aurélien Gâteau has been making some outstanding progress helping me on it. 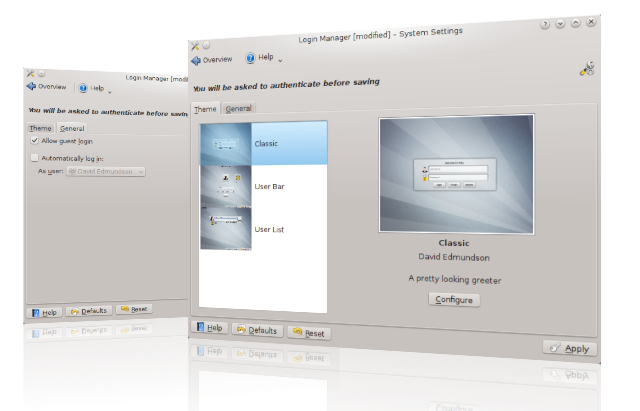 LightDM is a login manager, much like KDM, GDM, XDM etc. It handles all the complexity of setting up X, and dealing with PAM for logging in users. 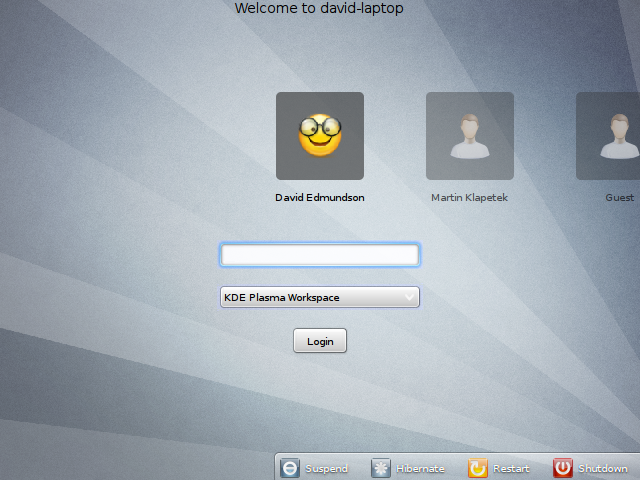 LightDM is interface-agnostic, so we built a KDE front end on top, cleverly called lightdm-kde. Why is LightDM-KDE more awesome than everything else? Use of QML makes themes a lot more powerful than anything elese . We have guest support (if the distro supports it) and can provide visual user selection. Hopefully by using QML we can also have a completely seamless changeover to KSplash which now also has a QML frontend. I’m really excited about guest support, as it serves one other useful purpose; every KDE developer can test how their app looks when it first loads to a user without any excuses or difficult setup. One of my main goals in LightDM-KDE is getting round this idea that themes and customisation are mutually exclusive, like we see in KDM. There are two tiers of customisation, wanting to change the background, some text or a corporate logo which many many users will want to do, and the second stage of wanting to build an entire new theme that looks radically different which is only used by a few people. Using technology stolen from plasma each theme can specify some configuration options, allowing the vast majority of users to make those little tweaks without having to learn how to build a whole new theme. LightDM-KDE is at that stage where it’s ready for testing. You can try it out in a sandbox mode, by using “lightdm –test-mode” which starts a nested Xephyr X session without disturbing your normal login processes. The backend itself, LightDM, is already deployed on Ubuntu and therefore has been tested on millions of computers already. It’s still a bit rough round the edges in a few places and therefore not really distro default ready. You can see this a bit in the screenshots, they’re not as good as I want them to be but hopefully this will be fixed over the upcoming weeks. KDM still has some features we don’t, but we have a /lot/ that KDM doesn’t have. Open any bugs at bugs.kde.org selecting the component LightDM. If anyone has any designs/mockups for themes or better yet wants to design a theme please get in touch with me. I recommend you use distro packages where available for all the extra code dealing with setting up init.d etc. You will probably find you need to make a symlink in /usr/[local/]share/xgreeters called default.desktop to lightdm-kde-greeter.desktop. We cannot do this at install time as it would cause clashes. Run with “lightdm -d” for debug, this will generally tell you what’s wrong. If not, open a bug report.